It ended up being two months between casts, give or take a few days. Illness, a lack of time and a monster bout of lethargy had left me dry through all of August and most of September. If I was going to end such a drought, then it may as well be somewhere extraordinary. 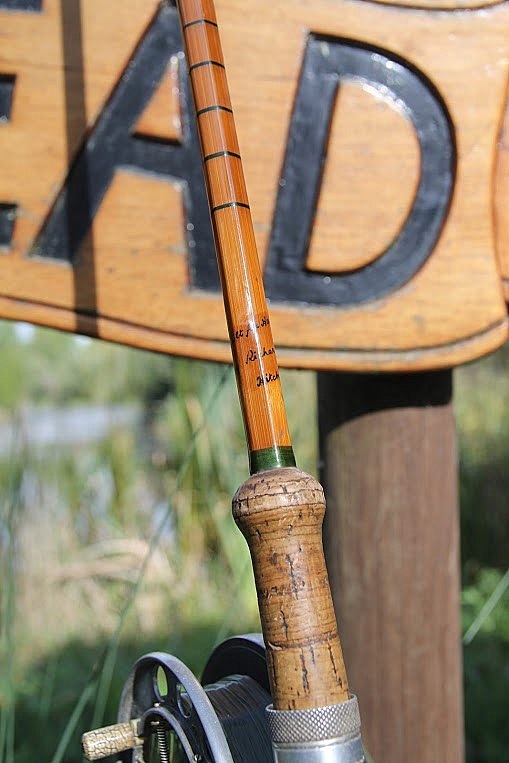 Ashmead is arguably the most revered carp lake in the country. Mark Walsingham, who co-owns and runs the fishery with wife Shona, has fished the lake since he was a small boy. 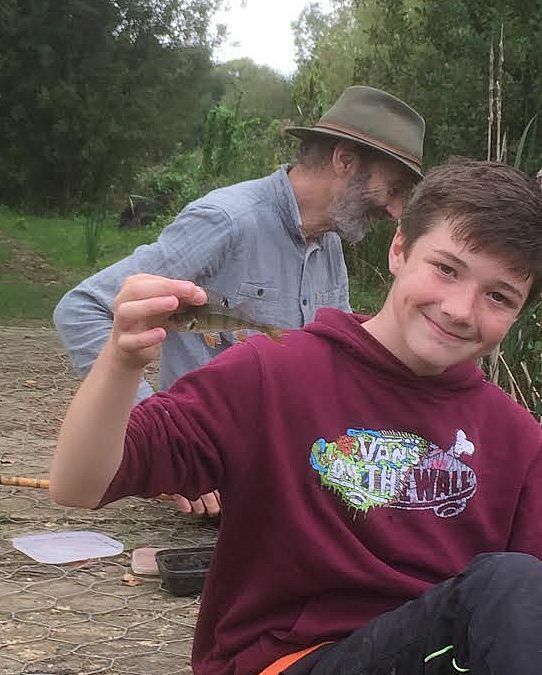 This was where he cut his teeth, caught his first carp, and such is the job he has done restoring this wetland habitat, his services are much in demand. 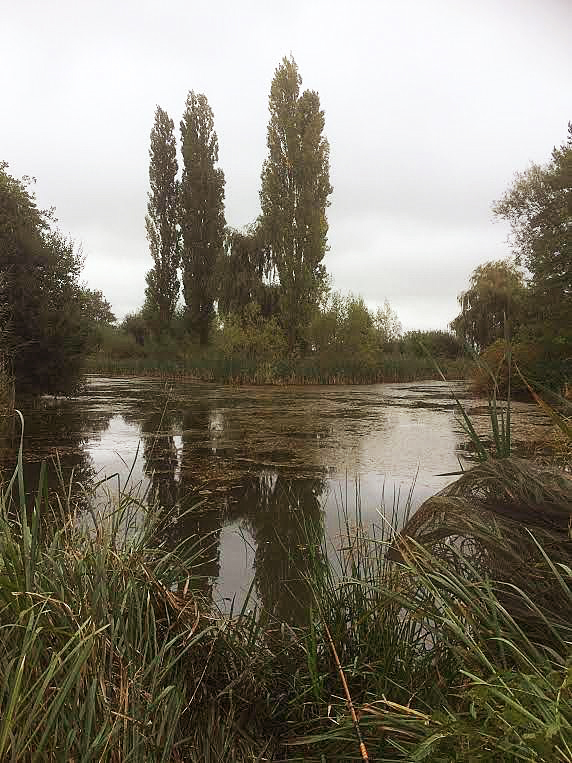 Mark (Skeff to many) has recently been assisting with the restoration of the most iconic lake of all, Redmire Pool – it is safe to assume he will make a fine job of it. A friend I had not seen for a decade prompted this trip. 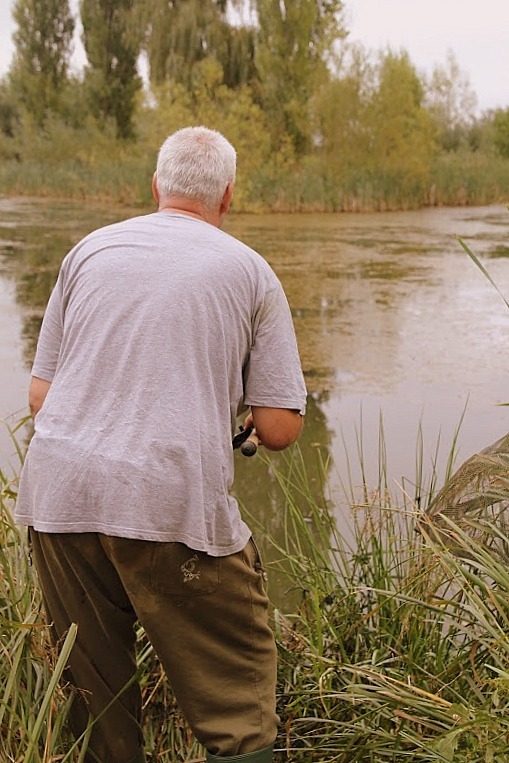 Andy Maple is a seasoned carper, being a one time Kent record holder for the species, but foolishly became the father of twins and has fished little of late. He had fancied journeying to Ashmead for many years and booked us in for a 48 hour trip, spending the evening before at our cottage before we headed up the A37 with slightly fuzzy heads on Monday morning. Skeff met us just after lunch to show us round. I always like to walk a venue before making a cast, but have had a problem with my foot for a few weeks and couldn’t hobble far. I did spot a bubbler in a quiet corner near the car park though, and let the others walk on while I sprinkled in a bit of bait and readied a rod. I had half a thought that I might catch a fish with my first cast, but the bubbles fizzled out as soon as I swung a bait over the top of them and the reality of fishing for wily old carp in a lake brimming with natural food began to emerge. I fed another couple of handfuls of bait and began to set up camp. Andy had leant me his spare brolly and bedchair (as well as a rod, reel and bite alarm) which I pitched beneath a bankside willow before limping off to find how he was faring. He had spotted a big fish soon after arriving and decided to set up nearby, baiting up a couple of holes in the weed close to the bank. As we chatted, it soon became apparent that Andy’s experience of reading such a water was far greater than my own. He pointed out a couple of likely patrol routes that I would have otherwise overlooked, and showed me a well worn patch of lake bed beneath an oak that was obviously grazed by carp. As the light faded, Andy produced a couple of ciders from his bag and fired up his stove to cook a spectacular curry. Fed and watered, I headed back to my swim with some mild optimism, but having cast out and switched on a bite alarm, couldn’t settle. I hadn’t deliberately gone to sleep with a bait in the water before, and just couldn’t relax. In the end I reeled in and decided to get my head down in order to make the most of an early start. The promised overnight rain amounted to little more than a light drizzle and I slept well, waking as the Eastern sky began to grey. With the Kelly Kettle fired up (I had gathered some dry stuff the previous evening) I went for a wander with a cup of tea. The lake was surprisingly quiet. I had expected to find a fair bit of fizzing in the half light but not a single fish showed. Andy came over for the second boiling, excited to have had a run shortly after midnight but disappointed to have bumped the fish. As we chatted, a few small bubbles pinpricked the surface of my swim. The water does hold tench, but they are rarely targeted, and only a couple are caught by accident each season. These bubbles looked tenchy to me though, and I set up a float rod with the intention of proving myself right. By late morning, and after catching a couple of thousand rudd, I gave up trying, and went for a wander just as Chris arrived. We said our hellos and had a peak around the channels that linked the pools at the Eastern end of the lake. As we watched, a great plume of bubbles billowed up from beside a weedbed. Finally – a feeding carp. Chris had come perfectly equipped for carp, with a 60 year old Avon Mark IV built by Richard Walker, coupled with a pre-war Aerial reel. But I had a rod already set up and was soon back in the hotspot, only to find the bubbles already bursting to nothing. I crept a bit further along the bank and spotted another bubbler midway in the channel. It was in thick weed and I wouldn’t be able to get a bait to it, but as I watched, another fish began ‘tenting’ in the same patch of weedbed. I slipped off the shot and reached for a piece of bread crust, landing it two yards beyond the fish. Within moments, the carp began to stir. It was a big fish, far larger than anything I have ever caught, and was definitely taking an interest in my bait. The next few minutes were gloriously intense. The carp edged closer, seemingly tasting its way through the weed, before coming within a slurp of my bait. As I watched, the carp slowly pushed its mouth open, and as it did the crust rode up in the water. In my haste, I had forgotten that I had a swivel attaching the hooklink, and that had sunk the line immediately above the hook. The carp had come up directly beneath the line and was pushing the bait away from its own reach. I knew I was rumbled, and the fish slowly sunk away out of sight. It was the best chance I would get. By the time Skeff arrived with son Alistair for the afternoon walk round, Chris and I were embroiled in a perch fishing competition on the car park bridge. Skeff suggested another spot, where he had seen some big perch a week or two back and we followed his lead, with Alistair also joining in with his drop shotting rod. Alistair gave Chris and I quite a humbling…. As Andy wandered over to watch the humiliation, Skeff happened to mention a local pub that was unquestionably the best in Somerset. Eyes lit up, and within an hour we had left the carp to mooch and were sitting around beside an open fire with pint glasses charged and fish and chips on the way. Skeff was quite right. What a pub. In fact, it was suggested that it would make a perfect venue for future Golden Scale Club AGMs which in turn prompted the discussion of this year’s shambolic AGM organisation. The meeting had been due in late May, but no-one had bothered to arrange it, so an EGM was called for July. Of course, no-one bothered to arrange the EGM, so an emergency meeting was called for September to discuss the lack of organisation of the EGM which was called to discuss the lack of an AGM. Now, with September all but over, the emergency meeting wasn’t going to happen either. With the Club Secretary present, it was decided to call a meeting there and then, and in the time it took Andy (a non-member) to nip outside for a cigarette, business had been concluded and we could get back to scrumpy drinking. Needless to say, I wasn’t the only one who didn’t cast a line that night. Wednesday broke cold and clear, with a heavy dew. My head was decidedly thick and I made no effort to find a dawn carp or even a breakfast carp. Andy had cast one rod out, but Chris didn’t emerge until mid-morning. The carp had evaded us, but Ashmead had not disappointed. It truly is a special piece of water, and attracts some particularly fine-minded anglers. 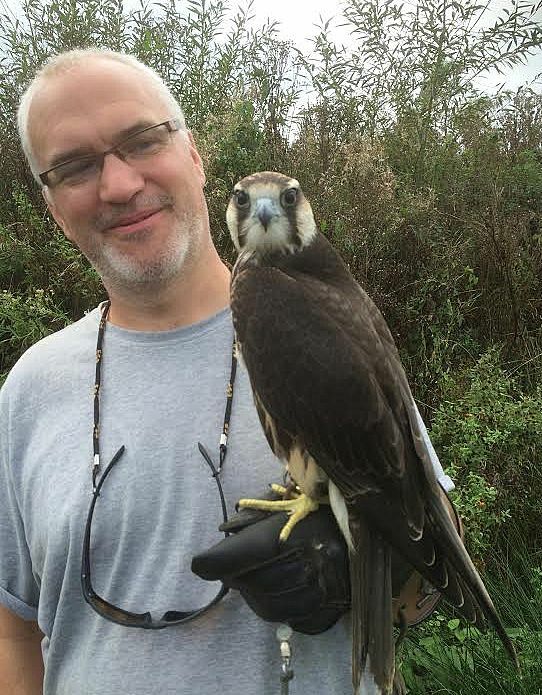 Those fishing the same time as us were full of generosity and good conversation, and to cap off the trip, Martin, a syndicate member, turned up shortly before we left with Maverick – a 22 week old lanner falcon – on his arm.